As the complexities of human dog relationships become increasingly numerous in these difficult times I thought I would try to help out by bringing you “5 Signs Your Dog Loves You How Will You Score” as a tool to help you know where you stand in the relationship with your dog. This fun post is brought to you from DogTime by way of the Divine Caroline blog. So much of the human canine relationship is serious, very serious so I thought it would be great to just take a break from the serious and take a look at our puppy pals from another perspective. Is it your sparkling wit? Or the smell of sausage on your fingers? Read on to find out how your dog really feels about you. These days, it’s difficult to know whether your dog truly loves you, or whether he’s just hanging around for the free cheese cubes and access to the toilet bowl water. It’s a scary thought: What if your dog’s just not that into you? You get the feeling your dog’s up for cuddling, regardless of what you’re wearing, when you last showered, or how foul your morning breath is. He doesn’t care that you’re still sporting sneakers from 1983 or notice that you haven’t combed your hair in six months. Gain twenty pounds? No problem. That’s just more of you to love. You’re frying bacon and he acts like it’s the most fascinating thing he’s ever seen. Or you’re preparing a pizza and he becomes more rapt with each slice of mozzarella you position. If you feel his eyes on you, even when you’re simply making a peanut butter sandwich, you can count on this dog to be mesmerized by your every move. We all have friends who call and call and call their dogs before they get a response. Frankly, it’s a little uncomfortable for everyone. It’s like the more they bellow, “Mr. Snuggles, come here!” the further into the bushes the dog disappears. Ask yourself, when you call your dog, does he quickly bound to your side? Or does he seem annoyed and give you that I need more space look? how he’s feeling. If he wags to his right, you’re probably the human of his dreams. To his left, and it may be he’s just not that into you. Come on, could we make this stuff up? On a bit more serious note, please feel free to visit us for any of your dog confinement and dog transport needs. From small dogs to strong dogs we have items that will improve quality of life for you, your family and your dog. 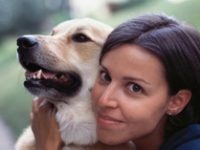 I hope you enjoyed “5 Signs Your Dog Loves You How Will You Score” a fun look at the relationship we have with our dogs. I am certain we all can relate to many of these signs. Now go give your dogs a hug. My dog is definitely a right tail wagger! Nice fun post, thanks!